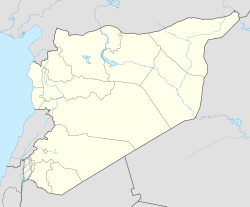 Al-Rai (Arabic: الراعي‎; al-Ra'i or al-Rayi, Turkish: Çobanbey), is a small town in northern Aleppo Governorate, northern Syria. With 4,609 inhabitants, as per the 2004 census, al-Rai is administrative center of the sparsely populated Nahiya al-Rai. Located at the Baghdad Railway and close to the Turkish border, right across Elbeyli, it is however a strategically important village.The town of Akhtarin, some 15 kilometers (9.3 mi) to the southwest. Larger towns are Azaz, some 35 kilometers (22 mi) to the west, and Jarablus and Manbij, both some 45 kilometers (28 mi) to the east. Prior to the Syrian Civil War, the town and its surrounding area was primarily inhabited by Turkish-speaking Reşwan Kurds, but also sizable numbers of Turkmen and Arabs were present. Many of the Kurdish inhabitants have fled due to Euphrates shield. The Çobanbey Railway Border Gate which had been closed since 1981, was reopened on 22 December 2009 after the 62km line between Aleppo and Çobanbey was renewed. The opening ceremony was attended by the transport ministers of Turkey and Syria, Binali Yıldırım and Yarob Süleyman. In the Syrian Civil War, al-Rai was captured by Free Syrian Army (FSA) forces and held until early February 2014, when the FSA-allies the Al-Tawhid Brigade and Conquest Brigade were assaulted by a predominantly Chechen unit of the Islamic State of Iraq and the Levant, (ISIL) who seized the town on 3 February 2014. Since then, ISIL considered the town its main stronghold in the Aleppo countryside. In the course of their Northern Aleppo offensive, FSA units captured the town twice in April 2016 and in June 2016, but both times were not able to withstand counterattacks by ISIL. The FSA recaptured the town a third time in the August 2016 Battle of al-Rai, but lost it to yet another time to an ISIL counterattack later in August. In late August 2016, rebels were reported to have recaptured the town for the fourth time with the help of Turkish forces (including tanks) and to have seized several villages close by. al-Rai is the administrative center of Nahiya al-Rai of the Al-Bab District. ^ a b "2004 Census Data for Nahiya al-Rai" (in Arabic). Syrian Central Bureau of Statistics. Retrieved 15 October 2015. Also available in English: UN OCHA. "2004 Census Data". Humanitarian Data Exchange. Retrieved 4 December 2015. ^ a b Günümüzde Suriye Türkmenleri (in Turkish) - Suriye’de Değişimin Ortaya Çıkardığı Toplum: Suriye Türkmenleri. ORSAM Rapor № 83. ORSAM – Ortadoğu Türkmenleri Programı Rapor № 14. Ankara — November 2011. ^ مسلم, علي (2016-06-14). "الكورد في منطقة الباب (الجغرافيا – عدد السكان – الواقع السياسي)". مدارات كرد (in Arabic). Retrieved 2018-08-30. ^ "استشهاد مواطنين كورديين جراء انفجار قنبلة/ مواجهات عنيفة بين داعش والجيش الحر في قرى ريف الباب الكوردي- زانا الكردي - الأيام السورية | AL - Ayyam Syria". ayyamsyria.net (in Arabic). Retrieved 2018-08-30. ^ Al-Tamimi, Aymenn Jawad. "Afrin Operations: Interview with a Kurdish Activist of the Shami Front". Aymenn Jawad Al-Tamimi. Retrieved 2018-08-30. ^ Newzad, Ariyan. "Ethnographic map of Rojava". Retrieved 2018-08-30. ^ "Turkey / Syria: the 3rd Railway Border Gate has opened". UIC eNews. International Union of Railways. 11 January 2010. Retrieved 28 August 2016. ^ Charles R. Lister (2015). The Syrian Jihad: Al-Qaeda, the Islamic State and the Evolution of an Insurgency. Oxford University Press. p. 203. ISBN 9780190462475. ^ "Turkish military hits Daesh position in Syria". Yeni Şafak. 11 April 2016. Retrieved 28 August 2016. ^ Keating, Fiona (27 August 2016). "Isis recaptures Syrian border town al-Rai after defeat in Jarablus by Turkish-backed rebels". International Business Times. Retrieved 2016-08-28. ^ Charkatli, Izat (27 August 2016). "ISIS recaptures Al-Rai following massive attack". Al-Masdar News. Retrieved 2016-08-28. ^ Umit, Ozdal (2016-09-04). "Turkish tanks roll into Syria, opening new line of attack". Reuters. Retrieved 2016-10-03. ^ "Syrian rebels advance on symbolic IS-held town of Dabiq". BBC News. 2016-10-03. Retrieved 2016-10-03.